Churchyard Brewery: And We're Off! Well, the Churchyard Brewery blog is now officially up-and-running. If my own professional website is any indication, this probably won't get updated as often as I'd like. But at least my intention is to add a post when I brew and when I have a great beer-related experience. I've often wanted to chronicle these experiences, and in the past I've tended simply towards reviews on Beer Advocate (user rinhaak if anyone's interested). But my friend and fellow brewer Mike Duncan over at Tippling House got me thinking more about chronicling my positive experiences as opposed to simply reviewing all the beer I've tasted. He reminded me that the majority of one's favorite memories circle more around the scenario and the people, rather than the actual consumed product. Hence this blog. 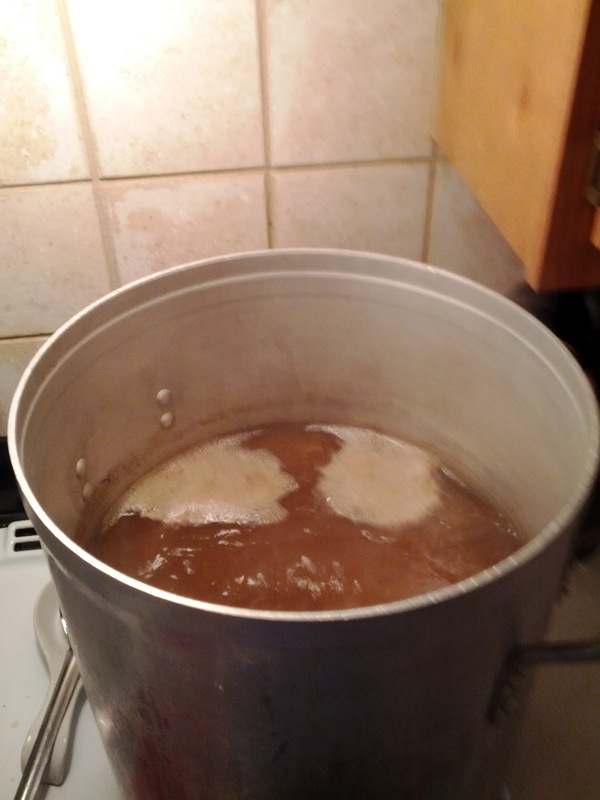 My other objective is to keep a history of the evolution of my home-brewery. It began with the absolute worst beer I have ever had (it seriously tasted like peanut butter), continued with a beer so high in ginger juice it actually broke my juicer, continued to a Cardamom-infused Belgian blonde that was not only a mistake, but oddly one of my most popular beers, continued through my extract days and into all-grain, continued through two new mash tuns, a temperature controlled fermentation chamber, and about about 120 gallons of beer. One of the challenges within the past fifteen months of brewing was determining just what my objective was. I began with odd-ball recipes trying to combine unusual flavors that I couldn't find anywhere else. And while it certainly yielded some very good beer (and taught me all of the basic fundamentals), it took a while to nail down a cohesive outline for just what Churchyard Brewery stood for. About four months ago, it finally occurred to me what I could do. Though much of the country is obsessed with high-gravity, high ABV beers, the Boston area seems to have become a hotbed for great session beers. Blatant, Jack's Abbey, Notch, these are breweries who have polished the art of a great session beer. And as a guy who puts in fourteen hour work days (I'm an artist, what can I say? ), I've really grown to appreciate these beers. These are beers that I can enjoy with dinner, yet still remain productive in the evening until I go to bed. So why not focus on great session beers? Over the past few months, I've been working out the kinks of two different recipes. One is a Belgian-style session ale, and the other is a German-style hefeweizen. Which is what I'm brewing tonight. I spend about 25%-30% of the year in Germany. As a result, I've really gotten to know a lot of German beer. And honestly, I was rather surprised and disappointed to discover that – albeit with some very notable exceptions – the German beer market was seriously struggling. The weren't struggling with production or consumption (Germany alone produces 26.5% of all the beer in Europe), but rather with creative, unique, and, dare I say it?, good beer. But there was one area that the Germans still thoroughly beat every American brewer: the Hefeweizen. That hazy, spicy wheat beer with a hint of banana... mmmm! It's amazing. And the more I visited Germany, the more I fell in love with this beer style. It was only natural, then, that I'd try to brew one. The first version brewed is barely worth mentioning. I don't know what went wrong, but I had terrible efficiency, and I wound up with a beer that tasted like stale rice cakes. The second version was actually quite good. 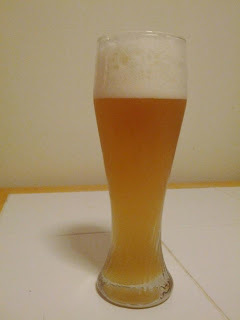 But the wheat:pils ration wasn't quite right, there wasn't enough clove-zest, and I wanted a darker color. Not Dunkelweizen dark, but more like melted caramel dark. So I went to work on Hefeweizen #3 (simmering away in my brew kettle as I type). I've darkened it by adding some Carawheat malt. It should darken the hue and add a hint of a caramel flavor. I'm also going to try reducing the banana flavor and up the clove flavor by lowering the fermentation temperature. I remember being struck by the spicy character of my first hefe, and I'm really trying to recreate that experience. We'll see, and in 34 days I'll know how close I got! Oh, and why Rhönring? It's my wife's German street address!